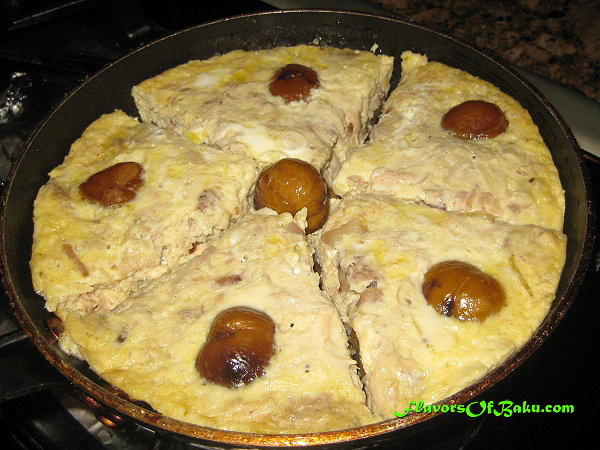 Khoyagusht is a delicate and delicious dish of Mountain Jew cuisine. There are a several types of Khoyagusht: meat (beef or lamb) and chestnut, meat, herb and chestnut, chicken and chestnut, and a simpler version with chicken and potatoes. The first part of the word “Khoyagusht,” “khoya,” means eggs, the second part “gusht,” means meat, and “kyarg” means chicken. 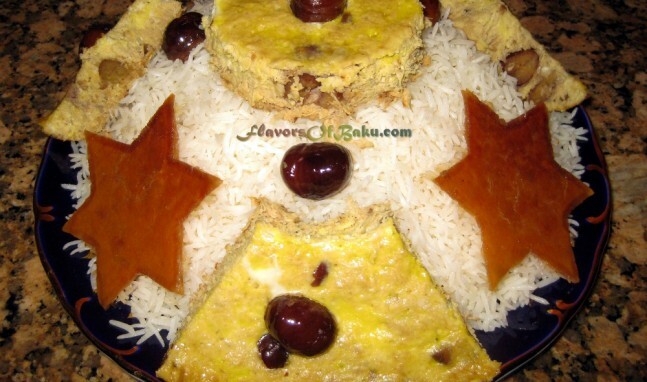 Khoyagusht is usually served with Osh (“Osh” means pilaf). Place the chicken in the pot and add just enough water to cover it. 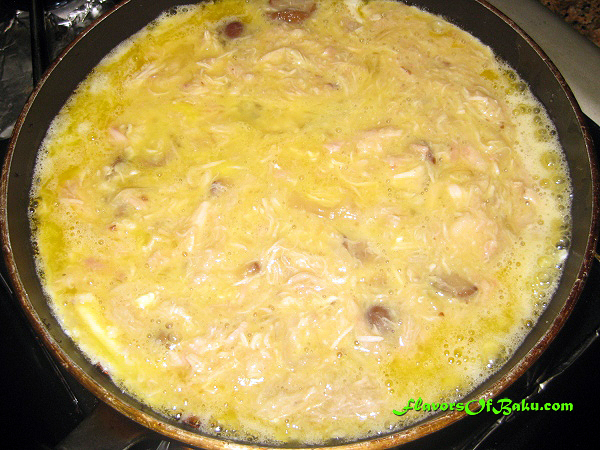 As the water comes to a boil, skim the foam off, add ½ an onion, salt, and pepper, then reduce heat to low and let it simmer for about 1-2 hours until the chicken is very tender, and the meat falls off the bones. 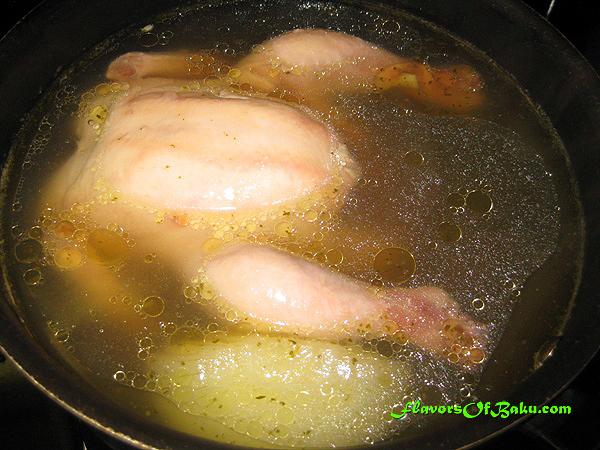 Allow the chicken to cool down in its own broth, then remove it from the broth. 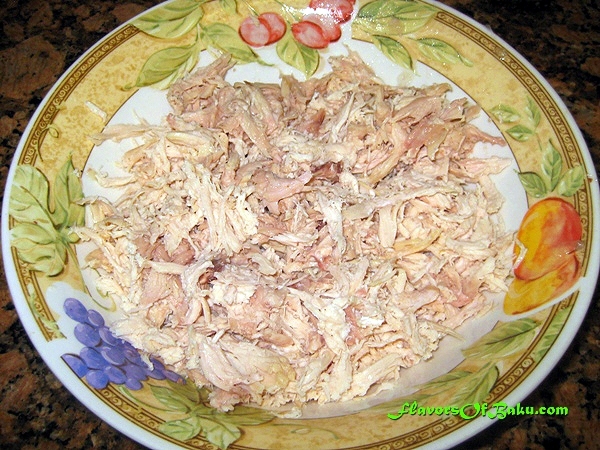 Separate the meat from the bones, and shred it using two forks or your hands to pull it apart. Peel the onion, cut it in half, and slice it into thin half-rings. Remove the fat from the surface of the broth and pour it into a skillet (you can add olive oil if there is not enough fat in the broth.) 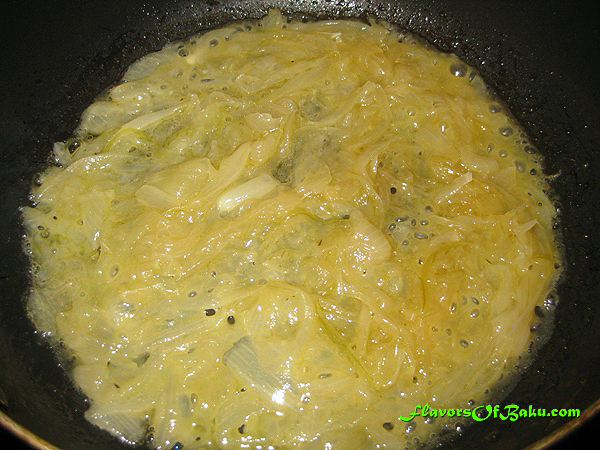 Warm the skillet and add the onion slices. Cook over low heat, until the onion is soft. You can prepare Khoyagusht by using cooked and peeled chestnuts, which vacuum-packed and ready to add to any dish. They are usually available at any oriental markets. If cooking with fresh chestnuts, make sure they are plump, firm, glossy, and heavy for their size. 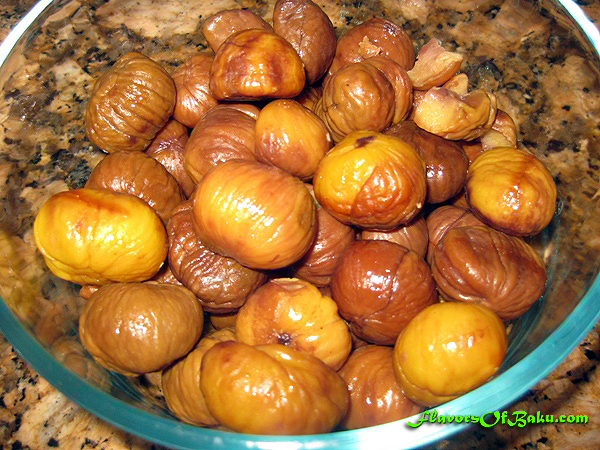 To cook with the chestnuts, you must first peel the shell and remove the inner skin. This is usually done by boiling or roasting them. If you are pairing your chestnuts with other flavors, you need to boil them. To boil chestnuts, use a sharp paring knife to cut an X on the flat side of each nut. Bring them to a boil in a pot of cold water and let it simmer for 20-30 minutes until the chestnuts are completely cooked. Remove the pot from the heat and scoop out the chestnuts, a few at a time, and peel off the shell and skin. As they cool down, they become more difficult to peel, so leave them in the hot water until you are ready to peel them. Khoyagusht without eggs is called Bor-Khoyagusht. 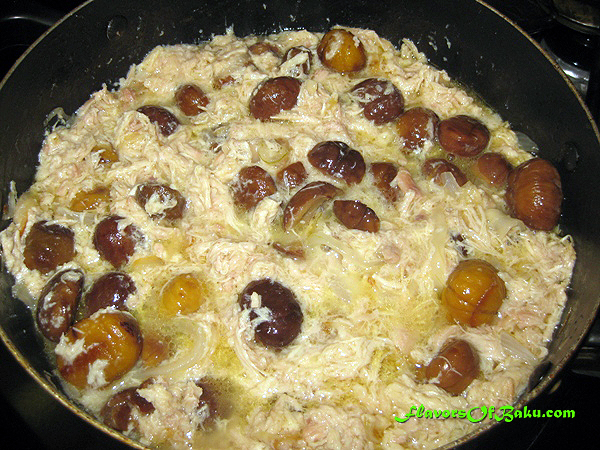 Add shredded chicken and cooked chestnuts (cut them in half if they are too big) into the skillet with the onion and mix everything together. Then, add a few tablespoons of broth, cover the skillet with the lid, and cook the mixture for about 20 minutes over low heat. You can prepare Bor-Khoyagusht in advance and keep it in the refrigerator for a few days before cooking. 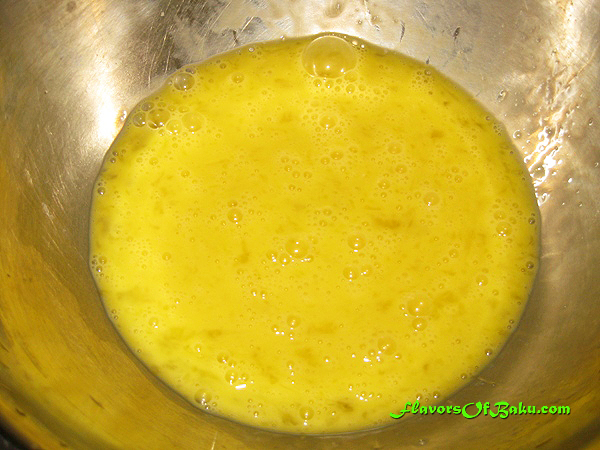 Whisk the eggs separately (save one of them for later). Add salt to your taste, and pour them over the chicken-onion-chestnut mixture. Lightly mix the ingredients right in the skillet. Then, separately whisk one egg and pour it on top of Khoyagusht. Cover the skillet with a lid and continue cooking over low heat until the eggs cooked all the way through and have set. Then, turn off the heat and leave the Khoyagusht in the pan for a minute to absorb all the juices. 4. 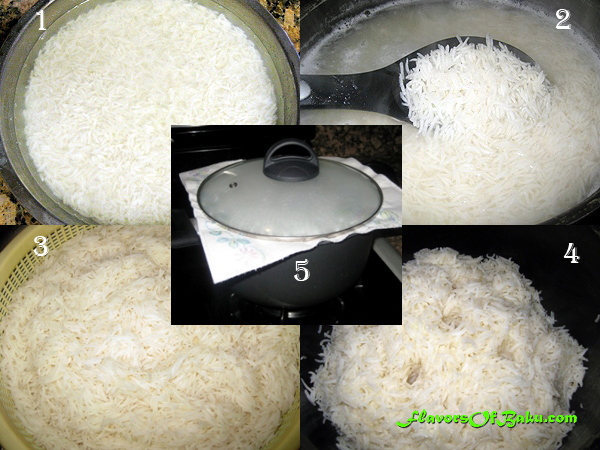 Move the rice into a pot, and pour 3 tbsp of hot water on top. 5. Wrap the lid of the pot in a tea towel or paper towel, and cover the rice. Cook over a low heat for about 45-60 minutes. Put a heat diffuser (or a pan) under your pot to prevent burning. Cut the Khoyagusht into portion-sized pieces and serve warm with Osh (or Matzah bread).